Neurocognitive program to train your cognitive abilities. Online platform where you can train your capabilities and strengthen the weakest ones. See your results after a few sessions. Sign up and try it! What are neurons? They are tiny cells that are in charge of participating in the functions related to the nervous system. In our brain, there are millions of neurons, scientists calculate that we have about 80 million when we are born. As we grow, this number decreases. After 80 years-old, we will have lost 30% of our neurons. Throughout our life, we constantly lose and regenerate neurons. By our neurons' regeneration process, new connections are made which produces a process called neurogenesis. This process allows for the birth of new neurons through a person's life. People do things daily that cause neural deterioration and, as such, cognitive deterioration. These actions, like drinking, smoking, not eating or sleeping well, or stress causes these neurons to deteriorate more rapidly. At CogniFit, we want to help you regenerate your neurons, creating new connections and training your cognitive capacity. Most people have heard the phrase “use it or lose it”, which is generally applied to physical exercise, but in our neurons' case the same principal can be applied. Here you will see a few reasons why it is necessary to keep your brain cells active. Active brain cells receive more blood. Scientists know that the active areas of the brain use more energy, and thus use more oxygen and glucose. This way, more blood is brought to these areas with the intention of satisfying the active neurons' demands. As you activate your brain, blood runs to the working brain cells. MRI images are used to understand blood flow in the brain. These images have shown that our brain cells, also known as neurons, are very dependent from the oxygen supply. The more we use our brain and activate the neurons, the more blood supply they receive. On the other hand, an inactive brain cell receives less and less blood until it ultimately dies. Active brain cells have more connections with other brain cells. Each brain cell is connected to its surroundings through rapid fire electrical pulses. Active brain cells tend to produce dendrites, which are like small arms that extend outwards to connect with other cells. One single cell can have up to 30,000 connections. As a result, it becomes a highly active part of the neuronal network. The larger the cell's neuronal network is, the higher the possibility of being activated and surviving. Active brain cells produce more “maintenance” substances'. The Nerve Growth Factor (NGF) is a protein that is produced in your body in the target cells. This protein binds the neurons, marking them as active, differentiated, and responsive. The more often you challenge, exercise, and active your brain, the more NGF is produced. Active brain cells stimulate the migration of the beneficial cells from the brainstem. Recent studies have shown that the new brain cells are generated in a specific area of the brain, called the hippocampus. These brain cells can migrate to the areas of the brain that need it most. For example, they would migrate to a certain area after a brain injury. These migrating cells are able to imitate the actions of the surrounding cells, allowing for a partial restoration of the damaged area. The neuron is made up by a structure whose main parts are the nucleus, the cell body, and the dendrites. There are many connections between the neurons due to the axons, or small branches. The axons help to create networks whose functions is to transmit messages from neuron to neuron. This process is called synapsis, which is the binding of the axons by electrical charges at a rate of 0.001 seconds, which can occur about 500 times per second. It is the central part of the neuron. It is located in the cell body, and is in charge of producing energy for the cells' functions. Dendrites are the “teeth of the neuron”, they form small branches that come out of different parts of the neuron. In other words, it is the cell body. The cell usually has many branches, and the size depends of the neuron's function and where it is situated. This is the part that includes the nucleus. This is where the molecules are produced and where the neuron's most important life-sustaining activities take place, as well as the care of functions of the nerve cells. 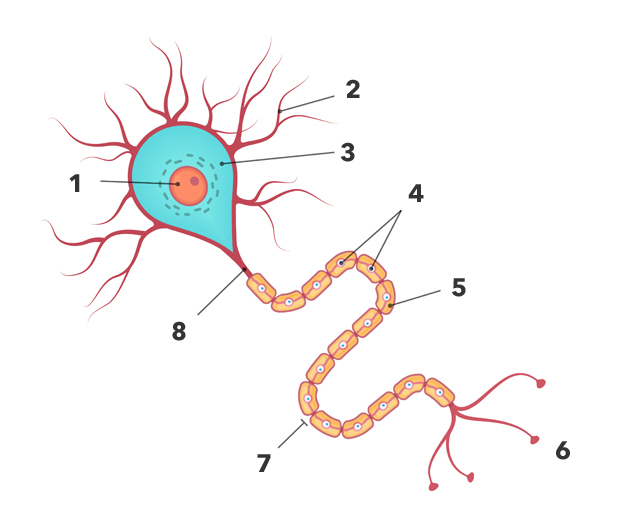 The Schwann cells are the cells that are situated in the peripheral nervous system and are responsible for accompanying the neuron during its development and growth. They cover the branches or axons and act like an insulating membrane. Myelin is a material made up of proteins and lipids. It is found in the neuron's nervous system and is covered by the neuronal axons, around a thick layer with an insulating effect and it is capable of transmitting the nerve impulses. This substance is made by the Schwann cells. Axon terminals, or synaptic boutons, are found in the neuron, divided into terminals whose function is to link other neurons and create a synapse. The brain's neurotransmitters are stores in the synaptic boutons in small areas called synaptic vesicles. The Node of Ranvier is a gap or space between each myelin sheath of the axon extensions. The space between each sheath is just enough, and is necessary to optimize impulse transmission and ensure that it does not get lost. The main function of the Node of Ranvier is to facilitate movement and optimize energy consumption. The axon is another main part of the neuron. It is a fine nerve fiber that is responsible for transmitting the electric signals between neurons. As was previously mentioned, axons have nerve endings that stop en the synaptic or button terminals of the axons. At the same time, the axons in the central nervous system are surrounded by myelin.